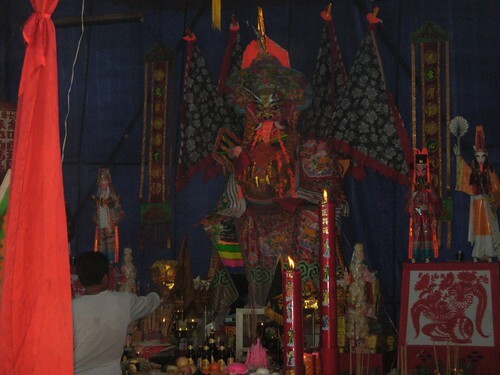 If I am read correctly, Hungry Ghost Festival falls on August 1, 2008. It is the first day of the Chinese seventh lunar month. It is the time when some Chinese believe that the souls from the netherworld are let out of their underground world and allowed to roam on earth. 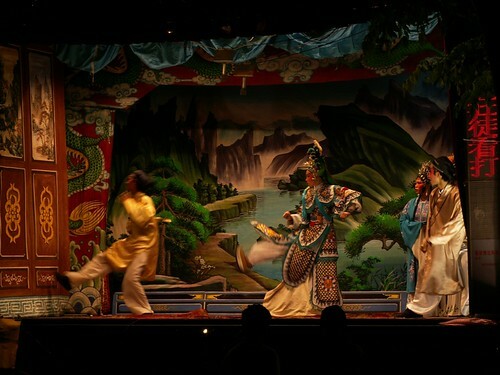 That’s why you will see a lot of stage shows or Chinese Opera like the above around the neighbourhood. The opera is to appease these wandering, hungry, souls who are on their annual ‘pilgrimage’ to earth. 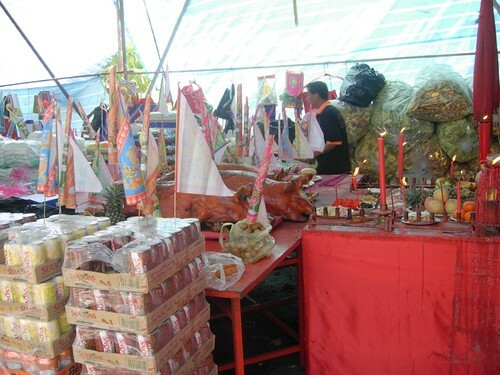 People will try to ‘offer foods’ to these hungry ghosts by praying. These foodstuffs will then be donated to the poor. Did you see a whole roasted pig being offered? Seen here, is the paper figurine of god of hades and his helpers. These ‘gods’ have pretty scary faces like having bull horns, danging long tongue, huge eyes and etc. Their ‘job’ is to watch over these ghosts to prevent the ghosts from disturbing the humans. Having said that, some people did go into trance when they are around these praying ‘stations’. One of my neighbour, a Chinese elderly man went into trance one day and he could speak Tamil, a subject foreign to him. So, whether you believe or not in the hungry ghosts, remember to be ‘polite’ during the whole month because you never know…. i got a fren whose father can recite the quran when he is in trance… and he is a hindu and does not understand arabic… u believe it or not?